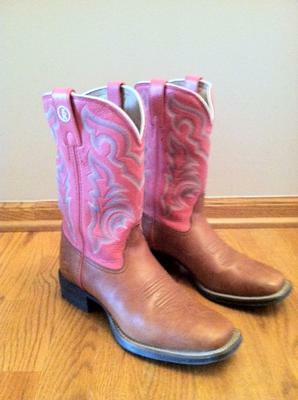 I have a pair of like-new Tony Lama's Women's Stockman 11" Western Boots size 8.5 D (wide), that I am looking to sell. I have owned the boots for a few years, but have decided they are too big for me. I have the original boot box and boots are in great condition, only worn a few times. I am asking for $100.00 or best offer, plus shipping. See pictures for reference and boot features and color info below. Boot features: square toe, leather material, orthotic insole for comfort cushion, pull-on boot with low heel height great for walking and riding- very comfortable. Boot color: bottom of boot is brown leather with mahogany & white welt stitch. 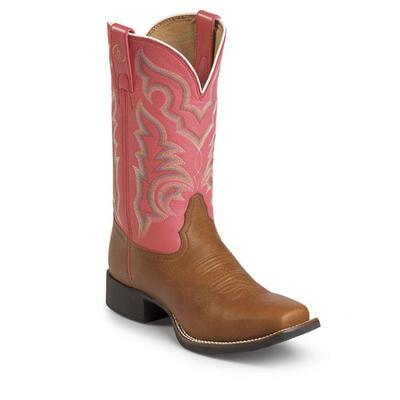 Top of boot is rosy pink leather with colorful stitching detail. Please contact me at monarch_15w@hotmail.com and let me know if you are interested in purchasing. Looking for a pair of boots... My daughter, who I would never think would want a pair does now. Was looking for a cheaper pair in case she doesn't want them;( If your will at 40.00 I would love to take them off ur hands. Their is a story behind this.. Contact me at 218 639 6356 if I have the chance.